February's Show & Tell Theme is "Quilts that Inspired." Bring up to two quilts to share - old quilts, childhood quilts with sentimental value, a vintage thrift store quilt with a killer design, etc. - that have inspired you in your own work. Modern Quilting - Philosophy or Aesthetic? Have you ever stumbled for a response when asked what modern quilting is? Or wondered what it takes to make an old-fashioned block into a modern quilting marvel? Our February guild meeting will feature Heather Grant, who will help us find the answers to those questions and many more. Her presentation will cover the philosophy of modern quilting and how it impacts modern quilt design. Heather will also provide a brief history on modern quilting and its early influencers, with an eye toward the tension that exists between the philosophy and aesthetics of modern quilting. She will clue us in on common design features of modern quilting and some key quilters in the movement. We will end the program with a 30-minute exercise on negative space and modern grid work. Please bring your Relay for Life quilt blocks to use for this exercise. If you are not participating in the Relay challenge, please bring a block from another project to use. Heather Grant has been sewing since the age of 10. A modern quilter at heart, Heather became frustrated early on with traditional quilting designs. She stopped quilting until 2005, when she was inspired by the modern quilting movement and made her first modern quilt. Since then, Heather has played an important role in the modern quilting scene as founder of a quilting bee that eventually grew into the Austin Modern Quilt Guild when it joined the national Modern Quilt Guild. Heather also is author of the popular blog, Modern Day Quilts, which was named one of the Top 55 Quilting Blogs by Quilter's Home magazine and has been featured in Fat Quarterly and Elle Decor. Please enter Form & Fabric from the back door - you'll see their logo and name on it. There's a parking lot by the back door, off of Evans Ave. The spaces are marked "reserved" but we can park there AS LONG AS we leave 3 spaces open for residents who live on the second floor. Please don't assume that they are "already home for the night," no matter how tempting that empty space looks! :) There's also ample street parking if you can't score a spot in the lot. Don't forget to visit our Facebook event to RSVP for the meeting. This is the first month of our six month block swap. You can read about the details of the swap by clicking on the Intro link in the 2012 Block Swap list on the right side of the page. Our first two inspiration blocks are a Star of Virginia and a Greek Cross. Katie of Swim, Bike, Quilt wrote a great tutorial for the Star of Virginia, and it can be found here. And Faith over at Fresh Lemon Quilts wrote a tutorial for the Greek Cross, find it here. Please make two blocks, one to swap with other guild members at the February meeting, and one to donate toward a future donation quilt. You can decide to follow one of the tutorials listed or create your own block. Blocks should be 12.5 inches square when finished, and may be made using any colors you choose. 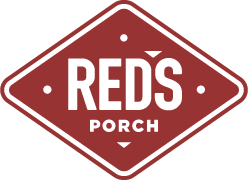 January Happy Hour - Red's Porch! Sorry folks, looks like we are going to cancel the South happy hour due to low attendance. Keep your eyes open for Central Happy hours coming up later throughout the year. Our January Happy Hour will be at Red's Porch on South Lamar (just north of Ben White/290). Join us on Thursday, January 26th starting at 5:30p for beer & food specials, and of course some modern quilt talk! This January we are starting a six month block swap! Any member of our quilt guild is welcome to participate and we have some block suggestions to help inspire the beginner quilters. Each month we will show two new block examples at the monthly meeting. Each participant will take time that month to make two blocks, either following the tutorials of the inspiration blocks, or creating a different block of their choice. Our inspiration blocks will be coming from the beautiful Summer Sampler Series hosted by Katie of Swim, Bike, Quilt, Faith of Fresh Lemon Quilts, and Lee of Freshly Pieced. Participants of the block swap will bring the two finished blocks to the next monthly meeting; one block will be turned in to organizers to be included in a future donation quilt, and the other block will be swapped with another guild member. When we reach the last month of the block swap, July, you will have contributed six blocks to donation quilts, and you will have six blocks made by fellow modern quilters. Use those blocks to make pillow covers, a table runner, a lap quilt, a donation quilt, anything you can come up with. We are also asking that as a block swap participant you contribute your crafty talents in some way to help complete the donation quilts that will be made from each member's six donation blocks. You can spend some time piecing a quilt top, donate some batting, cut and piece binding strips together, quilt on the long arm or on your sewing machine, or sew the binding onto a quilt. We look forward to seeing what blocks you come up with in this exciting AMQG block swap! Join us for a our first meeting of 2012! We will be meeting in a new location, at Form & Fabric's workspace, located at 508 E 53rd, #102, Austin TX 78751. PARKING DETAILS: Plan to enter Form & Fabric from the back door - you'll see their logo and name on it. There's a parking lot by the back door, off of Evans Ave. The spaces are marked "reserved" but we can park there AS LONG AS we leave 3 spaces open for residents who live on the second floor. Please don't assume that they "are already home for the night," no matter how tempting that empty space looks! (smile) There's also ample street parking if you can't score a spot in the lot. At the meeting, we will have an open show and tell (no theme) followed by some announcements and a fun activity that will have us moving around as we learn more about each other. We will also share information about upcoming mini-workshops, demos, retreats and other fun stuff.